Recognizes endogenous levels of RPA3 protein. KLH-conjugated synthetic peptide encompassing a sequence within the center region of human RPA3. The exact sequence is proprietary. Upon delivery aliquot and store at -20°C for one year. Avoid freeze/thaw cycles. Small volumes of anti-RPA3 antibody vial(s) may occasionally become entrapped in the seal of the product vial during shipment and storage. If necessary, briefly centrifuge the vial on a tabletop centrifuge to dislodge any liquid in the container`s cap. Certain products may require to ship with dry ice and additional dry ice fee may apply. 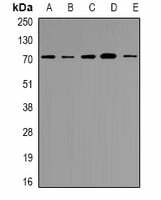 Western blot analysis of RPA3 expression in SW480 (A), MCF7 (B) whole cell lysates. NCBI/Uniprot data below describe general gene information for RPA3. It may not necessarily be applicable to this product. RPA3: Required for DNA recombination, repair and replication. The activity of RP-A is mediated by single-stranded DNA binding and protein interactions. 1. The allele "T" of rs6947203 in the RPA3 gene acts as a protective allele in glioma.